The Threefold 6 a trailable minimum cruiser for use on relatively protected waters. I drew her a long time ago to air some ideas which were in my head at the time. They were for an innovative folding system which would have made her a very versatile little boat, with unusual features. Aside from the versatility, the folding system also adds on a big cost factor so it did not take off. Anyway, I show her here for the interest of anybody who may like her concept. The folding system uses circular aluminium main beams mounted in bearings to give the choice of horizontal, vertical or inverted horizontal hinge axis orientation. This allows the amas to be swung up on top of the cabintop for trailing, in against the main hull for docking or down below the main hull to assist in righting in the event of a capsize. To date the principles of it have not been tested. She can also be built with demountable wooden box beams in place of the folding system, at greatly reduced cost. Sailing beam is 5m, giving her great stability to carry her sail area. Trailing beam is 2,44m either folded or dismantled. She has an easily handled fractional sloop rig with fully battened mainsail and rotating mast. 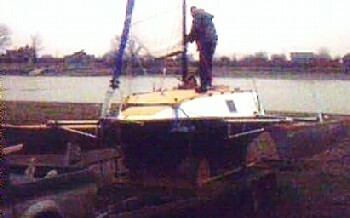 Standing rigging is arranged to allow the mast to stand without the amas in place although the shrouds to the amas must be in place for sailing. Shrouds are angled aft to eliminate backstays. While she has a lot of stability, provision is made in her sail plan for reducing sail considerably for use in a blow. Construction is of marine plywood, using the stitch and glue method of assembly for hull and amas. Epoxy coating of all plywood is recommended for strength and longevity. Accommodation is comfortable for her size, comprising a triangular forward berth, two wing berths, a two seater settee, galley worktop with lockers and camp stove to port and a plastic bowl sink with lockers under to starboard. Headroom is for sitting only but the large companion hatch opens up the galley area for standing. The companion steps remove for access to stowage behind, which would best be used for a portable head. So as not to affect the accommodation, two leeboards are used in lieu of a centreboard. They are of fairly small proportions to fit alongside the wing structure, with an effective depth of 500mm from static waterline which will increase with heel [the leeward board]. Both boards would be down for short tacking. The rudder blade is of the daggerboard type to permit beaching. Auxilliary propulsion is by means of oars, single skull or a small outboard motor. 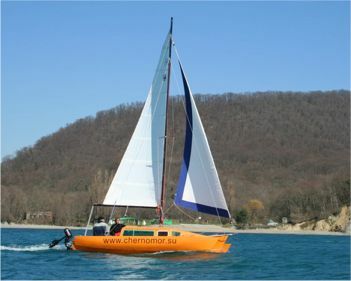 The Threefold 6 is designed to be a safe and lively boat to sail singlehanded or with a crew, ideal for comfortable gunkhole cruising in relatively protected waters. Follow these links to print a material list or a drawing list for this design. with the aluminium folding system. Oleg's boat with new colour scheme. Oleg Zelinskiy built his Threefold 6 in Russia. In November 2008 he went out in extreme storm conditions to test his boat. With winds of 15-22m/s (30-40 knots) and gusting to 32m/s (65 knots), they sailed with storm jib and deeply reefed main. He reports that she handled perfectly, even with seas washing over the deck through to the cockpit. She achieved speeds of 15-17 knots and was responsive and under full control at all times. He says that stability was perfect and there was no hint of the boat ploughing in. Oleg is very satisfied with his testing of the boat in storm conditions. In September 2009 Oleg reported that in 15-25 knots of wind he and one other crew had sailed 15 miles in one hour, with speeds sometimes exceeding 20 knots.